Any time you are faced with a legal issue, it’s only natural to be concerned with the implications it can have on your personal and professional life. At White Peck Carrington, LLP, we are committed to putting your fears to rest by providing you with effective legal representation in a number of different areas including divorce, personal injury, business law, criminal law and real estate law issues. White Peck Carrington was established in 1862, and although the name and the attorneys on staff have changed since then, our current lawyers are committed to continuing the legacy of excellence that the firm established more than a century ago. If you have been the victim of a personal injury, we work to help you get the compensation you deserve for your pain. From misdemeanors to felonies, we provide criminal law defense services in a number of areas, including drug crimes, violent crimes and homicide cases. We handle divorce proceedings and all related issues, such as child custody and spousal support agreements. Our real estate practice is focused on litigation, property law and ownership disputes in the Central and Eastern Kentucky area. Our business law attorneys handle a range of litigation and corporate disputes between companies and individuals. 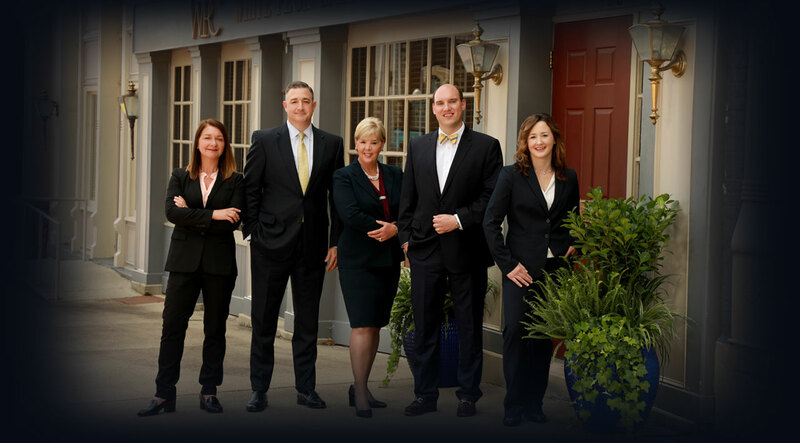 The attorneys on our staff have more than 150 combined years of experience practicing law throughout Kentucky. In that time, our staff has garnered acclaim from our clients and peers. Attorneys Alan B. Peck and Grover A. Carrington have both earned AV® Preeminent™ Peer Review Ratings by Martindale-Hubbell® for high ethical standards and professional ability. In addition, Michelle Williams, Stephen E. Neal and Jesse R. Hodgson have each earned Martindale-Hubbell Distinguished® Peer Review Ratings for high ethical standards and professional ability. We have designed our legal services to ensure fair prices for all of our clients. We don’t waste your time and money on unnecessary costs and paperwork; instead, we are efficient and effective when dealing with your case. We take pride in offering all of our clients direct and pragmatic communication with their attorneys. This face-to-face relationship between our clients and attorneys is the cornerstone of our practice. If you need legal assistance with a business law, criminal law, divorce, personal injury or real estate matter, call the Mount Sterling law office of White Peck Carrington, LLP at 859.498.2872, or contact us online, to schedule an appointment and inquire about our consultations.